Christopher Hanewinckel/US Presswire Prince Fielder, 27, might go for a 10-year deal considering the 31-year-old Albert Pujols got 10 years from the Angels. DALLAS — The Chicago Cubs come away from the winter meetings with a couple of little deals on the table but also a sense that they may have gained a stronger hold on returning to prominence in the National League Central without even having made a move. The loss of Albert Pujols, who signed a 10-year dealworth as much as $250 million, according to sources, is a big blow to the St. Louis Cardinals and can be a huge difference for the Cubs when examining the shift of power in the NL Central. With Pujols gone and Prince Fielder likely leaving Milwaukee, the top two teams in the division will be scrambling to maintain a perception of dominance. This is now a perfect opportunity for Cubs ownership and the new front office to make a big run at Fielder. Fielder wants at least a seven-year deal, and now because of Pujols’ contract, likely 10. 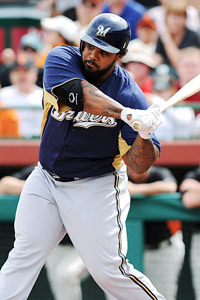 The Cubs Texas Rangers, Miami Marlins and now possibly the Cardinals will be in hot pursuit of Fielder, according to industry sources. At 27, Fielder is the type of young, dominant player the Cubs would like to build a championship team around. Look for the Cubs to move aggressively in a smart way toward signing Fielder while also concentrating on the international market. Right-handed pitcher Yu Darvish has committed to posting, and the Cubs will make a bid on his services. They will also take a run at Cuban outfieder Yoenis Cespedes, who is being courted by seven or eight teams. The bidding on Cespedes could go as high as $50 million. Cubs president of baseball operations Theo Epstein and general manager Jed Hoyer are determined to put their economic resources toward young, impact players and Fielder certainly fits the bill. He recently told a former teammate that he felt the Cubs would make the biggest push for him in the offseason. Now with Pujols out of the way, the Cubs should be going full steam ahead in the pursuit of a young difference maker on the field and at the ticket booth. The perception before Pujols signed was that he and Fielder didn’t have as many suitors as initally believed. Now with Pujols out of the picture, Fielder is in the cat bird’s seat with big market teams.